But on the “sunrise side” of the state, there’s another lake that calls to those who love big water: Lake Huron, home to Saginaw Bay. If your group is looking for a good time with an inexhaustible list of things to do this fall, Lake Huron is a great destination. Get on the water – Maybe you didn’t know it, but thanks in part to Saginaw Bay, an expanse of water 1,143 square miles in an area that forms the state’s Thumb, Lake Huron has the longest shoreline in Michigan. Your group can look forward to sailing adventures on majestic tall-ship schooners during the day, a dinner cruise in the evening, and a celestial excursion for an after-dark view of the heavens (picnic dinner included), among many other boating activities. Take a hike — For a day of fresh air and exercise in the great outdoors, how about a hike? The area boasts some of Michigan’s best trails, including the soon-to-be-opened Whiting Forest of Dow Gardens, the longest canopy walk in the nation at 1,400 feet (and it’s fully accessible!). This incredible tree fort in the sky opens to the public October 7, 2018 with grand opening activities taking place the week of October 7-14. As a part of Dow Gardens, the hours will be the same as the rest of the site: 9 a.m.- 6:30 p.m. in October. 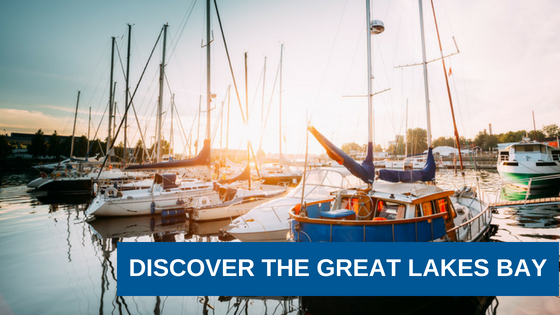 Other exceptional trails include the Great Lakes Bay Regional Trail System, a non-motorized trail system extending nearly 100 miles through Bay, Midland and Saginaw counties. You can also head over to the Chippewa Nature Center in Midland where 1,200 acres of upland fields, woodlands, wetlands, rivers and 15 miles of hiking trails await. If your group is into ecology or birding, try the Shiawassee National Wildlife Refuge at the confluence of the Tittabawassee, Flint, Cass, and Shiawassee Rivers. One of the largest wetland wildlife ecosystems in the state, the refuge is a major stopover for many migrating birds and waterfowl and home to dozens of animal species that happily flourish under the protection of the U.S. Fish and Wildlife Service. Don’t forget your binoculars and check out recent bird sightings here. Discover local history — Start at the beginning and span the 11,000 years during which Native Americans resided in Michigan, the majority of which were Chippewa (or Ojibwa) and Sauk. The Hartley Outdoor Center in St. Charles has an Indian village replica and the Oguakawning Indian Mission (established in 1847) are just two of the many sites to see. The Castle Museum of Saginaw County History looks like a French chateau and began life in 1897 as a post office but now houses a broad array of exhibits and events. Its sister museums countywide zero in on local history in Frankenmuth, Chesaning, Bridgeport and St. Charles. For a look at our nation’s naval history, it’s hard to beat an actual battleship for a museum so you’ll want to make time for the Saginaw Valley Naval Ship Museum. Home of the U.S.S. Edson, this museum is both a Michigan and National Historic Landmark. Find fine art — Honoring the work of an internationally revered sculptor, The Marshall M. Fredericks Sculpture Museum at Saginaw Valley State University displays more than 2,000 unique objects from the artist’s 70-year career. Fredericks was known around the world for his sculpted monuments, memorials, fountains, portraits, and medals. If your group is interested in a fine art immersion experience, the Midland Center for the Arts is an all-in-one venue that includes “art, science, history, music, theatre, dance, films, and world-class professional entertainers.” From Broadway to The Beatles, National Geographic to the Smithsonian, and films, fairs and festivals, you can’t go wrong at the Midland Center for the Arts. Maybe a smaller, more intimate setting is preferred? Check out the Pit & Balcony Theatre, one of the nation’s oldest community theaters, with a building dating back to 1948 and a troupe that was originally formed in 1932. This true community theater welcomes all who want to join in and act to audition, not to mention ticket prices are very reasonable. Michigan Great Lakes Bay area holds a treasure trove of fun, interesting, educational, and unique things for your group to do. If you need help planning your Great Lakes Bay tour, let Indian Trails help with our “Complete Guide to Booking a Bus.” Then contact us and let our experts help you make the whole process a breeze.